British Airways Concorde Room Review – How luxurious is the Concorde Lounge Heathrow? Ever since I set foot in an airport lounge, the British Airways Concorde Room has been at the very top of my list of lounges to visit. 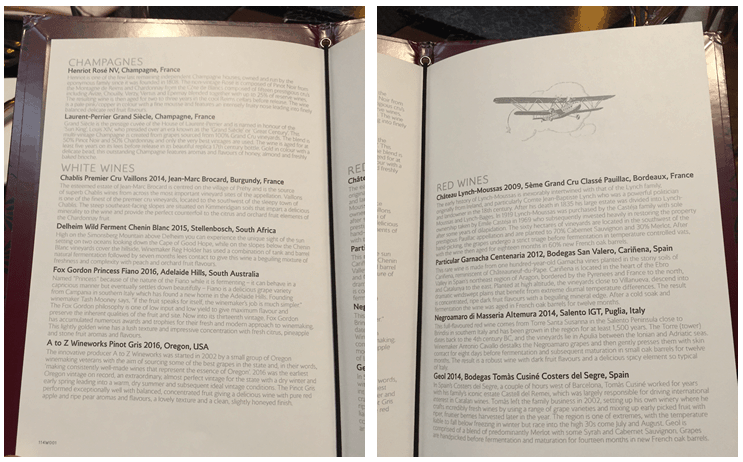 Was it the free-flowing, complimentary Laurent-Perrier Grand Siecle Champagne (at £120 a bottle) that attracted me to the Concorde lounge Heathrow or the a la carte menu to rival some of London’s most popular restaurants? Read on to find out why I think the BA Concorde Room Heathrow is by far the best lounge in the UK. British Airways Concorde Lounge Heathrow – Before you Arrive? How Anyone Can Access the Concorde Room? Note that unlike the British Airways First-Class lounge, the Concorde lounge is not available to Gold card members. 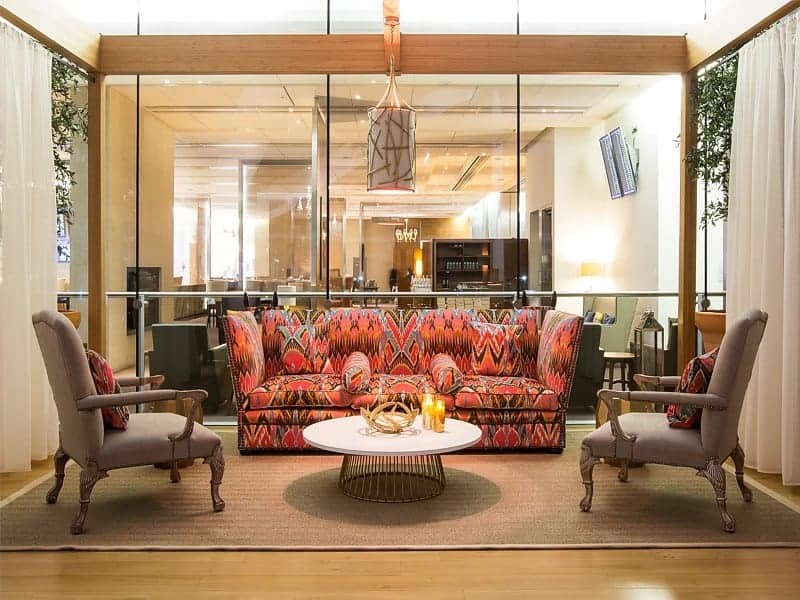 Although it’s relatively difficult to get to BA Gold (1,500 tier points) the First-Class lounge always seems to be busy, which is because a very large percentage of the travellers won’t be travelling in First and will in fact be BA Gold cardholders. I’d recommend anyone travelling with a First-Class ticket to make their way over to the Concorde Room. So how did an average Joe like me manage to gain access for 2 to the Concorde lounge I hear you ask. Well this was surprisingly easy and something that I’ll cover in a lot more detail later on in this Concorde lounge Heathrow review (scroll down section 4 if you’d like to learn more). Let’s start with some housekeeping. Is there a Concorde Room dress code? Nope, you’ll be fine in whatever you feel comfortable in although you may feel slightly out of place if you rock up in your pyjamas. Then again, why would you when you get free ones on the plane? Before you even set foot in the Heathrow Concorde Room, you’ll benefit from the full British Airways First-Class wing experience. As you walk through the golden gates at the far end of the T5 departures lounge, you quickly move from the chaotic departures area to the peaceful BA First-Class check-in zone. We were booked onto a Friday evening flight at 22.25 and arrived at the airport nice and early to make the most of the whole experience! Every time I’ve been through the Heathrow BA First-Class wing, there has always been a free BA representative available to check you in, avoiding any possibility of queuing. 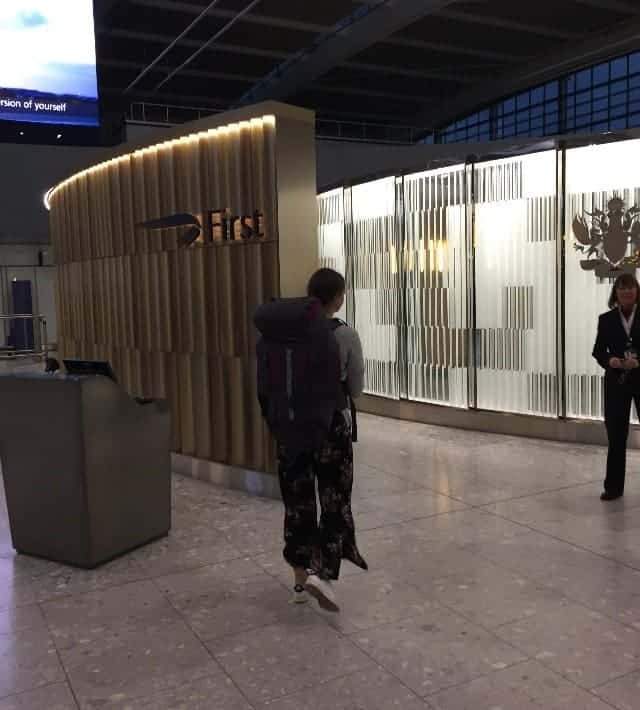 The First-Class check-in wing also benefits from a dedicated security area which will take you straight through to the First-Class lounge – you can see my full review of the BA First-Class lounge here. 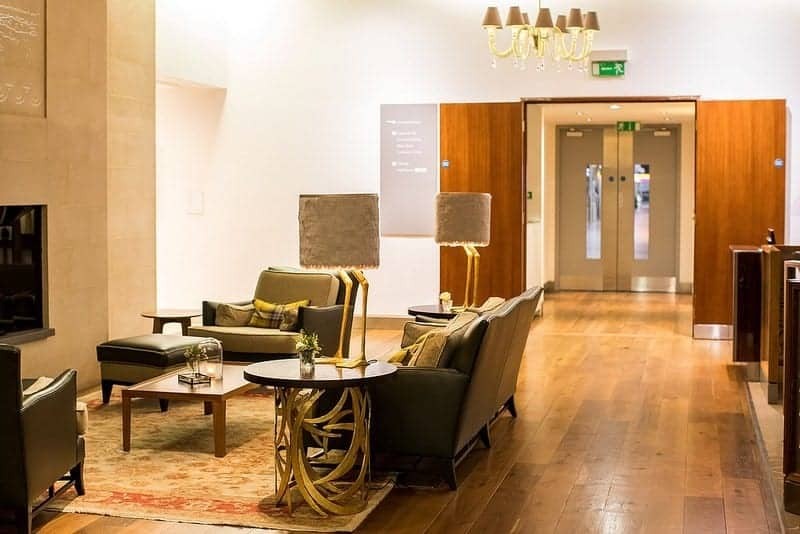 Now if you have a First-Class ticket, I wouldn’t waste your time in the British Airways First-Class lounge (reviewed here) – head straight over to the Concorde lounge which is situated opposite. My partner and I had come straight from work and as we knew we were going to be eating a three course meal on the plane we thought we’d try the a la carte restaurant straight away, leaving enough time for us to hopefully get hungry again before our next dinner! Fortunately for us, the Concorde lounge LHR was very quiet at the time we visited which meant that there was no problem getting a table. Unlike other BA lounges there’s no helping yourself when it comes to the British Airways Concorde lounge. Dinner is served in private booths, with seating for a maximum of two (three at a push!). Champagne was free flowing from the minute we took a seat. Hannah opted for the Laurent-Perrier Grand Siecle (she’s got expensive taste!) whilst I trialled the Henriot Rose NV. 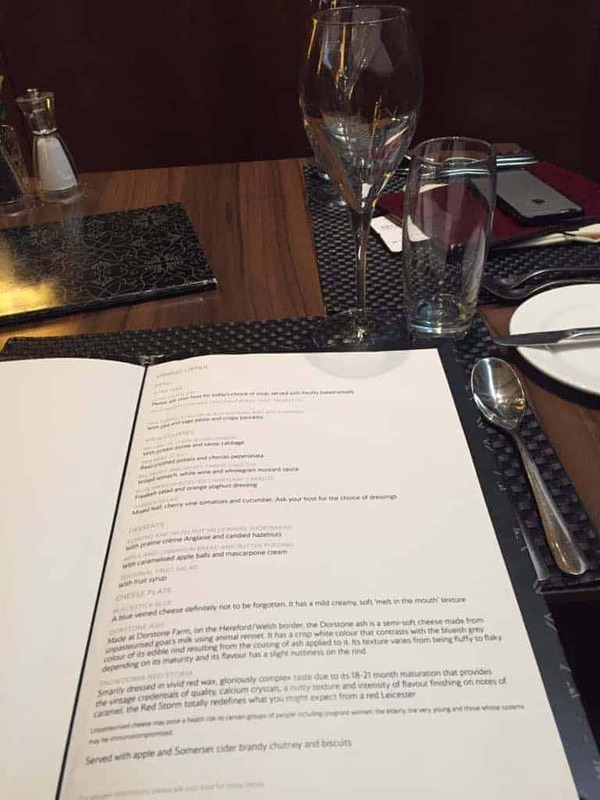 The Concorde Room menu changes on a monthly basis so you shouldn’t get bored no matter how many times you visit. Whilst we like the idea of mixing up starters we couldn’t decide who would have to go without the scallops and ‘settle’ for the wild mushroom & chestnut puree tart. So in the end we both went for the scallops knowing all too well that we also had this as an option on the flight. 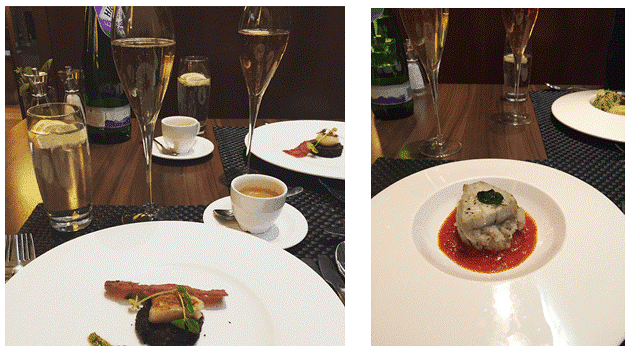 For main, Hannah chose the Pan-Fried Coley and I went for the British Ox Cheek Bourguignon – two very good choices. We stuck with the Champagne during the meal; maybe not the done thing however it was difficult to refuse something which would be completely out of my budget any other time. We also had the whole of the flight to get acquainted with a good bottle of the Chateau Lynch-Moussas 2009. Following cheeses and coffees for dessert, we decided that we’d make our way to the terrace area for some rest and relaxation. 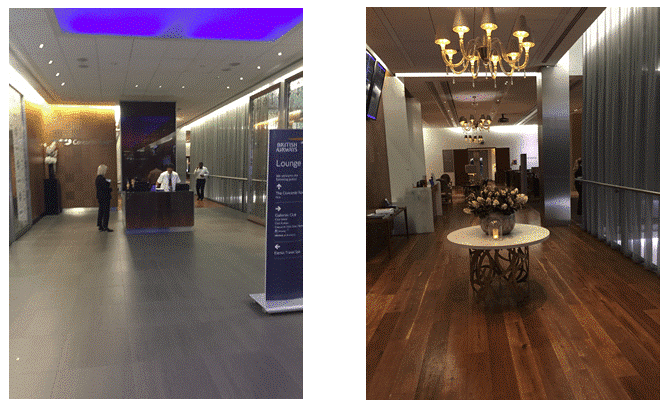 Now the terrace area within the Terminal 5 Concorde Room has been completely refurbished to a great standard. With bright fabrics and large double loungers you really could put your feet up and immerse yourself in the experience. I’ve seen some reviews that aren’t particularly complimentary about the fabrics. 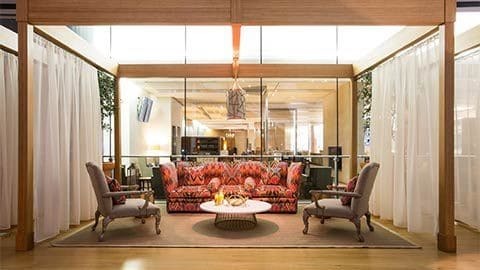 I’d completely disagree – this is less stuffy-1920s-hotel and more SOHO-House/Firmdale finish. 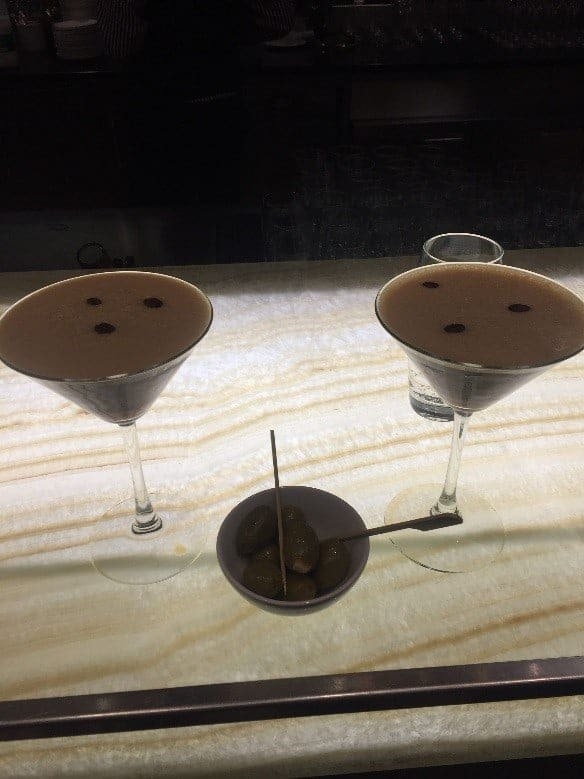 Just like the Champagne, cocktails are free flowing in the British Airways Concorde Room so we thought it would be rude not to try one or two at the bar with some olives. The Concorde Room offers various places to relax, so why not book your very own private Cabana? Unlike the rest of the lounge, I’m sorry to say that these haven’t been subject to refurbishment and are now looking somewhat dated. In the room you get a large lounge chair with a pillow and blanket. There is however no separation to the shower which feels commercial in nature. 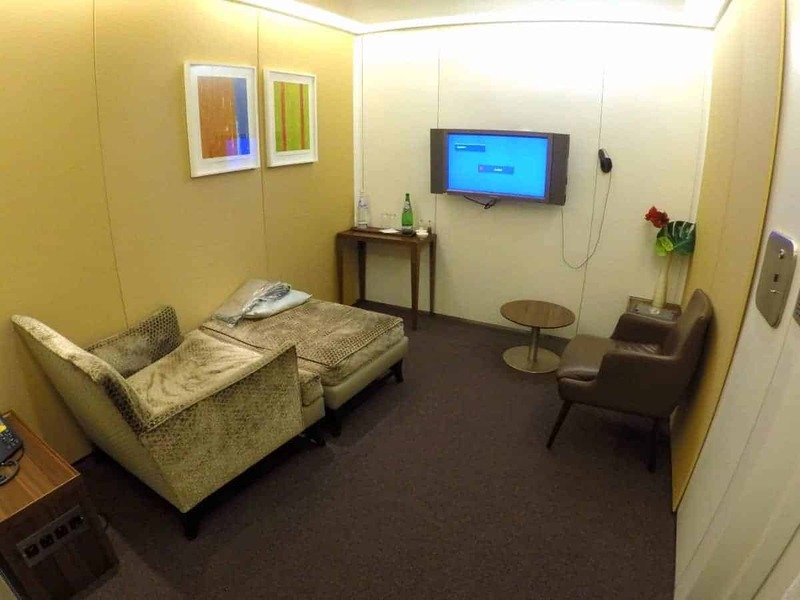 Other amenities in the British Airways cabana includes television and free international calls. We passed on the cabana and most probably for the best. 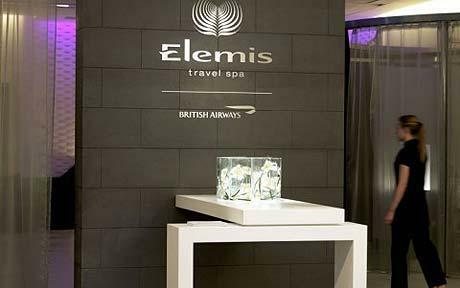 One of the major perks of travelling First Class is that you can book the Elemis Spa up to 28 days in advance. Business-Class passengers only get access to the Spa by turning up on the day, by which stage it’s almost impossible to get a space. Even with this knowledge, I stupidly thought I’d be able to book it a week in advance – how wrong I was! As you can imagine, this went down like a lead balloon with Hannah. So what did we miss out on? Deep Clean Aviator Facial – Power-up your skin! Deep clean and energise your skin, combining innovative sonic cleansing and high-potency actives, to fight the effects of flying. Muscle-Ease Power Back Massage – For the ultimate journey! Feel recharged and energised as we knead away tired, aching muscles from the back, neck and shoulders. First Class Power Shave – Feel refreshed after the skin-smooth power shave, exclusively developed by award-winning shave guru, Richard Anthony. Firm Up and Fly – Super-lifting on the go! Experience visible results with innovative skin-lifting face technology to help smooth and contour your skin. Runway Ready Skin Recharge – Prepare your skin to be runway ready! This highly effective facial combines revolutionary sonic cleansing to revive travel-weary skin. Jet Lag Eye Reviver – Pre-flight eye renew! Advanced infusion technology and anti-ageing superactives help soothe tired eyes and smooth away fine lines. BIOTEC Hands-On facial – BIOTEC works to switch your skin back on for visibly healthy, nourished and energised skin. Dream Flight Back Massage – Take flight! Feel stress-less and rejuvenated as we ease away muscle tension and stiffness from the back, neck and shoulders. Pre-Flight Reviver – Neck & Shoulder – Loosen up! Melt away tension in the neck and shoulders to help alleviate stress and leave you feeling revitalised. Deep Relax Scalp Massage – The pressure’s on! Help release tension headaches and feel travel-ready with an intensely relaxing scalp massage. Jet Set Power Polish – Perfectly polished in an instant! Get your nails shaped up, then select one of the stunning nail colours from Essie. Optional shape and buff available to male travellers. Sky High Brow Shape – Up, up and away! Celebrated brow experts, HD Brows have created a bespoke service to give you an instant brow lift and shape. Stopover Super-Charge – For those who prefer some private chill-out time, our intelligent massage chair delivers a multi-dimensional massage to banish fatigue and leave you feeling revived and refreshed. Now at the start of this review, I promised I’d tell you my secret as to how just an average Joe like me gained access to two of British Airways most exclusive privileges – a visit to the Concorde lounge Heathrow and a First-Class flight. The first card I recommend any new Avios collector to obtain is the American Express Gold Card: See my full review here. When you sign up to the card and spend £2,000 in the first 3 months, you receive a bonus of 20,000 points (or 22,000 if you use this link). These points can be transferred to Avios at 1:1. Now 20,000 is enough for two flights to Geneva return but not enough for a First-Class flight. Persuade your companion to also sign up to an Amex Gold card using the link to receive a further 22,000 Avios points. Now, the second card I recommend to slightly more seasoned Avios collectors is the British Airways Premium Plus American Express: See my full review here. The best thing about this card is that you get a 2-4-1 voucher, which means that both you and a companion can travel for the price of one. This reduced the total number of points we needed to collect to 100,000 (down from 200,000!). Note there is a charge for this card of £195 per year. 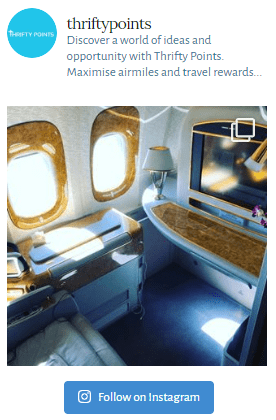 Alternatively there is a free BA card (reviewed here) which provides 5,000 Avios when you sign up and a 2-4-1 voucher at £20,000 spend, however I’d strongly recommend the premium version due to the easier spending limits and higher sign-up bonus. Sign up to the British Airways Premium Plus card using this link (and scrolling down to the correct card) to get 26,000 Avios (ordinarily you’d get 25,000 if you go straight to the website). Spend £3,000 on the Premium Plus card in the first 3 months to collect 26,000 points and a further £7,000 to receive your 2-4-1 voucher. You can always add your companion on to the card to help you reach those spending limits! With a total spend of £14,000 on both cards you’ll have accumulated 19,000 points through your spending. This in addition to the 2 x 22,000 sign-up bonuses and 26,000 bonus for the BA Premium card gets you a grand total of 89,000 Avios points. 80,000 Avios would get you a First-Class flight to the likes of New York, Boston, Bermuda, Dubai or even Toronto. Take a look on the rewards redemption section of the BA website for alternative destinations. One final reminder is to make sure your companion transfers their American Express Rewards points to your BA account and not theirs. Hopefully you can now see how possible it is for either a couple or two friends who are each able to spend roughly £7,000 on a credit card to obtain a free (expect taxes) transatlantic flight in British Airways First Class. If you’ve got any questions on the above please just either comment at the bottom of the page or alternatively send me an email using the contact me page :). Having recently been refurbished, the BA Concorde Room Heathrow T5 is a very special place. Whether you’re travelling with work and would like the privacy of a cabana to rest for a few hours or you’re a couple, like us, and want to make the most of the complimentary Laurent-Perrier Grand Siecle Champagne, the Concorde Room covers it all. I’ll be rushing back soon to take some better photos to add to this Concorde Room review and this time hopefully get booked into the Elemis Spa. Hopefully this post has provided some inspiration as to how you, too, could travel First Class the next time you go away. Thanks for taking the time to read this BA Concorde Room review and please do share it with anyone who you think may find it interesting.